Ciao tutti! I hope you had a good year, here is how mine went. I spent January through mid-April in central America working on various projects; two environmental and one archaeological. During January I worked as a volunteer with the Douglas Robinson Marine Turtle Research Centre at the Ostional National Wildlife Refuge on the northwest Pacific coast of Costa Rica, helping with the study of the population of Olive Ridley turtles that nest on the beach there. This is the smallest of the seven species of marine turtles, having a shell length of about 60cms and weighing about 40kgs. While the Olive Ridley is not considered to be endangered, little is known of their global population. This is due to the lack of research world wide, exacerbated by the difficulties of tracking them and the fact that the turtles have a life expectancy far greater than that of any research programmes. Occasional individual Olive Ridleys will come at night to the 1km beach at Ostional to nest throughout the year. However, the species is unique amongst marine turtles in that the vast majority of turtles nest at the same time of the month. At around the time of last quarter of the moon (half-moon, waning) the females will come to nest in large aggregations known as arribadas (arrival). During the peak nesting season, around August, up to half a million turtles will nest on the 1km beach over a ten day period. During the off-peak season, January to May, the arribadas are smaller and shorter, with "only" a few thousand arriving over a few days. Ostional is one of only three major arribada sites world wide. One morning, at sunrise, I counted 805 turtles on the beach! Females come and nest 3-6 times a year. They use their hind flippers to dig a hole in the sand above the high tide line, into which each turtle lays about 100 ping-pong ball sized eggs before filling in the hole. 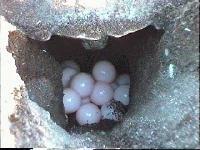 The eggs take approximately 40 days to hatch and the hatchlings then take another three to seven days to dig themselves out. The beach at Ostional is the only place worldwide where the collection of turtle eggs is legal. 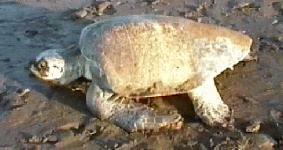 This scheme was introduced as a conservation measure, for as the turtles come to nest in such large numbers on such a small beach, some of the later turtles will inadvertently dig up and destroy the nests of the earlier turtles. The community of Ostional (pop. ~400) is allowed to dig up and sell eggs during the first couple of days of each arribada, these being the eggs that would most likely have been destroyed anyway. This has had a dramatic effect on the previously strong black market. With turtle eggs easily and cheaply available in the markets, it is no longer worthwhile for people to sneak onto beaches in the middle of the night to dig up a few eggs, resulting in a positive effect on all five marine turtle species that nest in Costa Rica. While I was at Ostional I helped in population size studies by counting tracks early in the morning outside of the arribada period, statistical counting by quadrats, every 2 hours at night during the arribada, and direct counting of individuals when it was light. 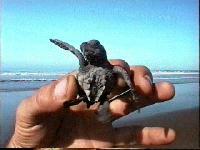 I also examined turtles for tags and obvious health problems, helped hatchlings reach the water and did beach patrols. I also had a little excitement in a "sting" operation in San Jose where staff members of the research centre, and myself, found some market stalls selling tortoise shell (taken from the Hawksbill turtle) and black coral products, both illegal under Costa Rican law and by international treaty. We feigned interest and returned the next day accompanied by the authorities, who confiscated all the goods. I then went north to the twin volcano island of Ometepe in Lake Nicaragua to join, The Ometepe Petroglyph Project, an archaeological project surveying parts of the island, looking for and recording pre-columbian petroglyphs (rock engravings). Several hundred petroglyphs were found, mapped and recording by photography and scale drawing during the six week survey. The figures included various recognisable forms such as smiling faces, monkeys, lizards and turtles, however, the vast majority were either geometric forms, spirals and circles being very common, or totally abstract collections of curvilinear lines. Regrettably, very little archaeological research has been done in Nicaragua, and the European colonists were quite effective in wiping out the indigenous population and, with it, knowledge of their cultural and ethnic history. As a result the origins of the petroglyphs are not known. It is thought that they may have been made by the Chorotega, an indigenous peoples that used to occupy the area, however there is only anecdotal evidence for this. Who made the petroglyphs, when they were made, why, and what most of them represent remains a mystery. The project was based at a hacienda, an organic coffee farm, and aside from the petroglyphs we saw quite a few howler monkeys, lots of parrots and the occasional tarantula. During the long weekend between the two three-week sessions I returned to Costa Rica to go to Arenal, an area with an occasionally active volcano. Unfortunately the weather wasn't very good, so we didn't get a view of the volcano. However, we did hike to see a 70m waterfall, bathed in hot pools and went to the local rodeo. I then went and spent a few days on the beach, on the Pacific coasts of both Nicaragua and then Costa Rica before moving onto the next project. From mid-March to mid-April I worked at the Genesis II Cloudforest Preserve where I worked on trail maintenance, collection and planting of acorns, and some topographical mapping. This is a 38 hectare private refuge established to protect endangered cloudforest habitat. 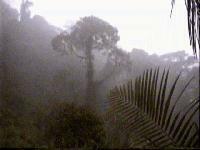 A cloudforest, as the name implies, is a mountain forest that is high enough to be normally in the clouds. Genesis II is at an altitude of 2360 metres (7500 ft) in the Talamanca Mountains of central Costa Rica. 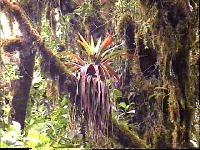 The constantly wet and cool climate provides a suitable environment for the lush forest that is dense with towering white oaks, fern trees -- some over 8 metres high -- and plants such as bromeliads, orchids, and hanging mosses, as well as vines and fungi. The cloudforest also provides a habitat for many species of birds, including hummingbirds and the Resplendent Quetzal, several species of mammals, like porcupines and squirrels, and frogs, butterflies and some huge moths. During our seven day break at Genesis, the other volunteers and I went to Arenal (again). This time the weather was good and we got good view of the volcano, seeing it emit a huge puff of black smoke one day. We also went to Manzanillo on the Caribbean coast where we visited the local wildlife refugee and hung out on some really lovely beaches. This side of Costa Rica is completely different to the rest of the country. Being populated by Afro-Caribbeans it has a different culture, different food, and a lot more people speak English. After central America I returned to England for a few weeks and then in May I went to Italy. I spent four weeks in Verona going to an Italian language school to try and, finally, learn some Italian. I really liked Verona, it's a lovely city with 2000 years of history and a marvellous collection of romanesque churches that haven't be 'baroque-ised', as in some other Italian cities. I enjoyed the language school as well; we'd do grammar lessons in the mornings and in the afternoons go to either cookery lessons, art history lessons, or on excursions to sights in Verona. For the whole of June and the latter half of July I participated in the excavation of the lower palaeolithic site of Isernia La Pineta, at Isernia, Molise, Italy, with the University of Ferrara. Isernia La Pineta is probably the oldest inhabited site site in Italy discovered so far, having been dated to 736,000 years ago. The site is assumed to have been occupied by Homo erectus, who is now generally believed not to have been a direct ancestor of Homo sapiens, but rather an evolutionary cousin. While no hominid remains have been found at Isernia there have been a large number of stone tools and an impressive quantity of animal remains unearthed at the site. 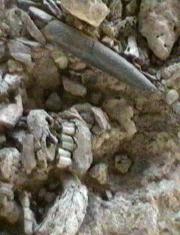 The bones found show signs of having been butchered using stone tools. There are grooves and scratches from the cutting off of muscle, and many long bones have been systematically broken for the removal of the marrow. Remains have been found of many large mammals, including prehistoric species of elephant, rhinoceros, hippopotamus, lion, bison, elk, bear, boar, and thar. Smaller animals include various rodents and hares. The large number of worked bones and tools in a small area has led to the belief that Homo erectus used the area, a site next to a river at that time, as a place to bring the corpses of hunted animals to be butchered. I spent the first two weeks of July doing an SCI workcamp in the laguna di Venezia. The first week was spent on Lido where we cleared the vegetation around an abandoned Austro-Hungerian fort as part of an ongoing project to convert historic military sites into public parks. During this period we stayed in a military barracks that is in the process of closing down. The second week the workcamp moved to the pretty island of Mazzorbo where the group worked on a farm that is being converted into a local museum. We cleared paths, made fences, and cleaned old farming implements for display in the museum. We stayed in accomodation on the farm. Of course, being so close to Venice, I did a lot of sight-seeing of the city. It was my second time in Venice, the last time being for the carnival some 13 years ago. Although Venice is a really beautiful, even magical city, I did find it rather tiring. It has suffered as a result of its uniqueness in that it is very touristy and very crowded. All in all, this wasn't a very good camp, partly due to lack of a coordinator, but largely because most people had come for a cheap vacation near Venice, rather than with the spirit of doing an international workcamp. After the camp I visited Bologna for the first time, and Ravenna (2nd time) with one of the other volunteers from the camp. We had a great time and I was really impressed by Bologna. The churches and mosaics in Ravenna are, of course, incomparable. 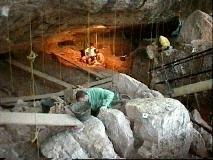 I then returned to Isernia for two weeks to continue working on the excavation there. I then moved just 60km north of Isernia to do a Legambiente workcamp held in the charming medieval village of Pettorano sul Gizio in the mountainous region of Abruzzo. The work was clearing a path and building fences and steps along the banks of the river Gizio, with runs just below the village. The path we cleared followed the route of a medieval path, part of a old network linking villages in the region. Accommodation was in a local primary school. We spent most of our spare time entertaining ourselves and visiting the two bars in the village, as well as getting to know the local people. This was a very pleasant camp, with a good group of people and in a delightful, albeit rather quiet, location. Santa Maria delle Molle is at the southern end of the Parco dell'Appia Antica just south of Rome, and was the site of my next Legambiente workcamp. The Via Appia Antica is the oldest of the Roman roads. It was started by Appio Claudio Cieco in 312BC to facilitate the conquest of southern Italy. The work consisted of clearing the vegetation covering the ancient road in preparation for a team of archaeologists that would arrive after the workcamp. Accommodation was in a local primary school. Of course, being so close to Rome a lot of the group's spare time was taken in sight-seeing in the city, as well as visiting the towns collectively known as the Castelli Romani near the workcamp site which are famous for their wine (e.g. Frascati) and porchetta. This was actually quite a terrible camp with, again, a large number of volunteers being more interested in a cheap holiday near Rome than anything else. We were only asked to work three hours per day, four days a week, but half the group couldn't even get up the motivation to manage that! I guess I won't be doing any more workcamps near famous cities in future. After this camp I went to Rome where I spent a couple of weeks staying with various friends. Then I went back up to Verona. For five weeks during September and October I participated in the excavation of the palaeolithic site of Riparo Tagliente, at Stallavena, Veneto, Italy, held by the University of Ferrara. Riparo Tagliente is a valley-bottom rock-shelter located in the pre-Alps just north of Verona. The shelter was occupied in various cycles dating from 60,000 to 12,000 years ago by Homo neanderthalis and Homo sapiens. In previous excavations a human burial was found as well as art in the form of stones with images of animals engraved on them. The site has a considerable quantity of flint tools of various kinds as well as a vast amount of flakes from the napping process. This has led to the belief that a part of the shelter was used for the production of tools over a long period of time. Also present were a significant amount of bones, from smaller animals like rodents and fish up to larger animals such as cattle and deer, as well as a number of snail-like shells with holes in them, presumed to have been used for necklaces or other types of "jewelry". In addition the site yielded deer antlers (curiously all of them burned), pieces of ochre, and pieces of the collapsed ceiling stained with ochre, indicating that at least part of the shelter was decorated. Some of the more exciting finds during the excavation were a fine bone point tool, and a small stone with a hole bored in it, probably for use as bead for jewelry. As at Isernia, as well as activities directly related to excavation I also did a lot of "site" jobs like building walls, fences & guard rails, re-doing the electrical installation, etc. After the excavation at Riparo Tagliente I went back to Rome. I was hoping to be able to join the archaeologists excavating the Via Appia Antica, but I ran into Italian bureaucracy and instead spent five weeks waiting and playing Age of Empires at my friends! I finally returned to England towards the end of November, in time attend the training weekend for my next adventure. I'm off to the South Pacific in mid January! I'll be joining a ten week expedition in Fiji with a UK organization called Greenforce. We will be doing a survey of the coral reefs around the small island of Yadua, so right now I'm studying diving theory and tropical fish. There's just one village on Yadua, an hour and a half walk from the expedition base camp, so we'll be living an almost desert island existence. I expect I'll do a bit of travelling after the expedition. As for next summer, I don't have any plans yet, but as always, I hope I'll meet some of you during my travels.